Spring is arguably the greatest season. As winter passes the hallmark cold, bright mornings mark the coming of summer. It’s a time for digging out the ice-cream, early morning jogs, and (of course) Third Space Learning’s Spring-term topical Maths series! In particular, this spring has been a hugely exciting time for us here at Third Space; seeing the release of our new topical Maths series, including several blog posts, a Spring-term KS2 Topical Maths Problems resource, and a (numeracy)shed-load of fun (read: bad maths puns). Our blog posts have covered several calendar dates this term, from Heart Month, British Science Week, and Holi, to World Book Day, International Women’s Day, and Red Nose Day. We’ve been simply amazed by the responses from schools participating in the fun and using our activities. While it’s always incredible to see people utilising our resources – and pupils enjoying them! – it’s only fair we recognise the incredible schools, teachers, and people who have taken to social media to share their teaching with us. So without further ado, here are some tweets we received from schools like yours this series. Also see Wendy Vanhegan‘s pupil enjoying her Third Space session Wizard of Oz style! Admittedly this one is from last year, but it’s too good not to share again – can you really blame us? Red Nose Day this year was an incredible success. Comic relief has raised a staggering £73,026,234 so far, which will be put towards transforming lives in the UK and Africa. Plus, lots of schools got involved in the giving, fun, and used our resources to boot. Clytha Primary looked deep in concentration as they got stuck into our ‘Money Maths’ investigations, we definitely have some #mathstronauts here (full link to tweet here). Meanwhile, Bede Primary School submitted some stellar mathematical calculations, great work guys! See the full tweet here. We also saw a Parks Academy’s Year 6 class laser focused on greater depth percentage and were enormously proud. Then James Jones sent a video of his pupils engaged and cracking on with our Money Maths investigations – see the full video here and just listen to the buzz in that room! Before sending this absolutely heart-warming tweet of his pupils saying thank you, view the full version of the video here – it’s worth it! Needless to say an audible ‘aww’ circulated the room. This was exactly the kind of tweet that reminds us why we go to work in the morning. Of course, with such a heartfelt tweet we just had to reply to show our appreciation. In fact, everyone who tweeted us @thirdspacetweet got a red-nosed thank you video. You can see the full version of one of our thank you videos here. 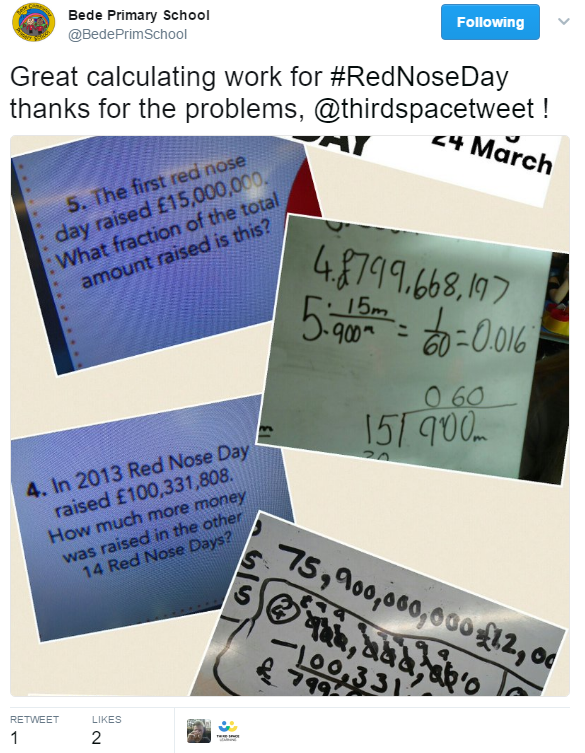 Were a very happy team, as we love receiving pictures, videos, and tweets of your pupils using our resources and are always more than willing to send a quick thank you video back, so tweet us @thirdspacetweet with your pupils’ #mathsmusclesworking! What’s next for Topical Maths? Unfortunately, our spring-term topical maths series has come to and end. Needless to say, we were beyond overwhelmed with how many teachers found both the resource and the blog posts useful. Therefore, we have an announcement. There will be a summer-term topical maths series, as well as a corresponding investigation based resource! Just like last the spring term series, we will include 20 topical problems in one resource, for you to print and give to your students in lessons. Moreover, we will publish blog posts with investigations for you to use in the classroom. We are intervention providers of our word! You can find links to our summer series of Maths investigations KS2 in this blog post. With another 40 activities in the new resources, there’s no “reason” not to take a peek.